Joanne Kennedy is a degree qualified Sydney Naturopath and Specialist in MTHFR and methylation practicing in the Sydney CBD. Prior to establishing her own practice, Jo worked at MTHFR Support Australia as a Naturopath specialising in treating patients with the MTHFR gene mutation and methylation issues. With her knowledge of methylation and biochemical pathways, Jo has helped hundreds of patients with chronic health issues finally heal. You can read about these success stories on Google Reviews. Joanne also specialises in digestion & gut health, histamine intolerance, mental health, women’s hormones and skin conditions. Joanne’s approach is to identify the root cause of illness. This is done by the use of functional pathology testing, assessing the biochemical individuality of each patient, assessing environmental exposures as well as individual genetic testing if required. Treatment includes the use of evidenced based natural medicine including diet, supplements and herbal medicine. After months of testing, I found out I had a genetic cell disorder called MTHFR. This would explain my digestive issues, my anxiety, my unexplained infertility and some of my metabolic issues. After much research, I found Joanne Kennedy. She is extremely knowledgeable, approachable and reliable. This helped me feel relaxed and confident that I was in the right hands. After 4 months of treatment I started to feel energetic, happy, less anxious and was able to focus better. I had never felt better. I have been seeing Joanne, for almost 2 years now, she has given life-long tools to heal my own body. I want to take this opportunity to thank you for your unwavering support, love, advice, and expertise. I am very grateful and lucky to have you. You have played such a large part in my health and recovery. I highly recommend Joanne Kennedy to anyone who has MTHFR or a vested interest in the health and wellbeing of their body. I’ve suffered from major depression and premenstrual dysphoric disorder for many years. I’ve tried all the classes of anti-depressants with only marginal improvement in my symptoms. The pharmaceutical drugs have heaps of side effects and no matter the dose or the drug combination, when I am on them I remain so debilitated that I can spend two weeks out of every month in a foetal position. My depression places a huge strain on my relationships and makes work and study desperately hard. I’ve spent years going to see doctors and specialists who ultimately give up on me or patronised me because they can’t seem to find a solution to my problem. By the time I came to see Jo I was at my wit’s end. I’d tried everything. Jo took a thorough history and did a series of blood tests. It turns out that I have a genetic abnormality with the MTHFR gene which means I can’t adequately produce serotonin. This is the reason why I didn’t respond to the anti-depressants. She gave me supplements and helped me with my diet. The result has been unbelievable. Jo’s help has changed my life. Her diagnosis and interventions were founded on scientific research. She was patient and caring and she didn’t give up. I am so much more functional now. I really don’t know how to express my gratitude. For more than twenty years I have suffered from recurring dermatitis. Itchy skin, head, neck, face, ears – sometimes it has been excruciating, preventing me from sleeping or working easily. Over this period, I have gone to countless dermatologists, undergone countless tests and every time I have been provided with the same unwanted news – “Take this topical treatment (cortisone, tar-based treatments, (sometimes antibiotics)) and learn to live with it. Don’t get stressed as much. Don’t aggravate things. There is no cure” Joanne looked at the problem differently and figured I had histamine issues. She prescribed me products that reduced the effect of histamine. I have not had itchy skin since I started taking her advice. It is a miracle (at least as I see it). I wish I had known about her twenty years ago. The relief is extraordinary. I have suffered from depression for as long as I can remember. There was rarely a time when I didn’t feel tired, anxious and moody. I also suffered from eating disorders and never felt comfortable in my own skin. I was taking antidepressants that did not seem to work for me as I was just getting worse and worse. Being treated by Joanne has literally saved my life. After working together to correct my nutrient deficiencies and change my eating habits, I can now truly say I have my life back. I feel energised, positive and motivated. During the course of treatment with Jo I was able to reduce my dose of antidepressants and I am now so happy to say that I no longer take any antidepressant medication after 20 years of use. I cannot recommend Joanne highly enough. Before I came to see Joanne Kennedy, I was suffering from chronic fatigue for years. My fatigue was so bad it was affecting my mood. I felt sad, overwhelmed and would get very stressed easily. At times I felt depressed due to my fatigue. I saw numerous doctors and had many bloods tests done. The results always came back within the normal ranges from the pathology labs so the doctors couldn’t see any issues with my results. It wasn’t until I saw Joanne in clinic and she evaluated my blood tests, that numerous results were considered sub-optimal. What I have learnt form Joanne is that pathology result ranges are too broad and if you are at the upper or lower end of the range, there is likely to be problem that needs to be addressed. After correcting my nutrient deficiencies I felt a significant improvement in my energy straight away. I no longer feel fatigued. My energy is great day to day. I’m handling stress a lot better, my mood is better, I no longer feel sad or depressed. Overall I feel fantastic! I highly recommend Joanne as a Naturopath. She is very knowledgeable, caring and supportive. Having suffered irregular and absent periods since puberty, at 21 I decided to see a naturopath in the hopes of receiving advice other than the typical“why don’t you just take the Pill?” After seeing Jo, I knew I was on the right track as she took the time to comprehensively discuss my diet, lifestyle and medical history, so as to identify and treat the cause of my amenorrhea naturally and holistically. As a vegan, it was important to me to find a practitioner who would work with my beliefs and for this reason, I am so glad Jo respected my decisions and took the time to plan nutritionally balanced vegan meals with me. To help things along, she also prescribed some herbs and I cant express how thrilled I am that within 60 days of my first consultation, I had my first normal period in years. With Jo’s help, I know I’m finally on my way to achieving regular menstrual cycles and I could not be happier or more grateful. Joanne is an AMAZING practitioner. She has so much health experience and is very knowledgeable. She is very dedicated in what she does. I have been seeing Joanne for about 3mths now and she has helped me through so much. I have been suffering from a complex histamine intolerance , Dermatographic urticaria amongst other health issues and for the first time in a long time i feel ‘normal’ and everything is controlled and i feel the best i have felt in a very long time!! I would recommend Joanne to anyone! She has been an absolute blessing!! Before treated by Joanne for my MTHFR gene and methylation issues, I had been to four western medical practitioners over the course of three years. They told me my debilitating fatigue and associated complaints were simply imagined. I felt dismissed and utterly defeated and disheartened. A friend recommended Joanne to me and after the initial consultation I immediately felt validated and reassured. Three to four weeks later I began to feel amazing benefits. My energy increased dramatically, my anxiety decreased: and now has completely gone. I felt the benefits immediately and since my first consultation I continue to feel better and better. This has been life changing for me and I think Joanne is fabulous. I would recommend her without reservation. Jo is a wonderful practitioner. She has a lot of knowledge and spends the time to work through whatever issues you are experiencing. She has helped me immensely with my gut problems, which was something that I had been struggling with for ages (and had tried so many avenues before and failed!). Definitely recommend Jo if you are looking for better health!! I’ve been a patient of Joanne’s since September 2017. Prior to working with Joanne I suffered from severe eczema, hives, fatigue and excruciating period pains all my life. My eczema covered the back of my knees so bad I was unable to walk and was in hospital a number of times. I would break out in hives and a rash across my arms, face and neck regularly after eating. My period pains were so painful I was unable to attend work for the 1st day and would need to take pain killers for the duration of my period.I was feeling really depressed as I had been to see so many people but no one was able to help me. Finally, I found Joanne and she changed my life forever. Joanne was able to identify the underlying issue behind my health problems. 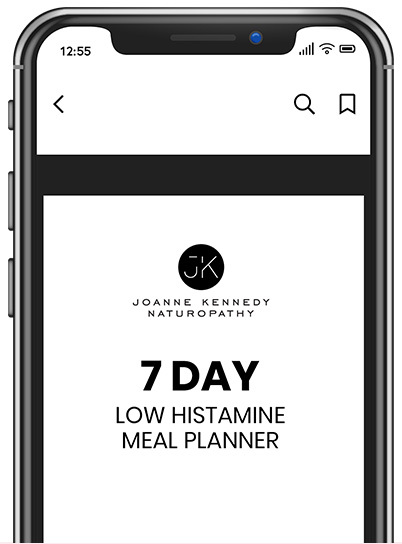 Over the past few months I’ve been working with Joanne on my histamine intolerance and she has helped me change my diet and take the appropriate supplements to get my histamine intolerance under control. The severe eczema behind my legs has now healed, I went from not being able to walk properly in August to now being able to exercise 6 times a week. The eczema across my face, neck and arms has completely gone. Over the past 5 months I’ve broken out into hives only a few times. Prior to seeing Joanne I was breaking out into hives at least 3 times a day. My period pain has considerable decreased and I’ve only had to take painkillers twice over the last 5 months. After years of suffering with these health issues and spending so much money looking for answers, there is finally light at the end of the tunnel, thanks to Joanne. I know understand my body and my triggers so I can manage my health with her support. I’m so grateful for the past 5 months with Joanne and I’m looking forward to living a more normal life now that I’m not constantly itchy, in pain or embarrassed about my skin. In my pursuit for health and wellness, living with Endometriosis, I have seen many, many practitioners throughout my almost 30 year roller coaster ride. I have learned that Women living with Endo need to be an active advocate for their health and wellbeing, they also need practitioners supporting them, who are completely up to date with the latest understandings of this chronic illness, as well as willing to learn from their clients. Effective care that works for one woman living with Endo, does not necessarily work for the next woman. Therefore treatment of the complex web of symptoms that can present with Endometriosis, requires patience, gentleness and great compassion. This is what I have found in Joanne. Joanne, has also been able to educate me, clearly, about MTHFR and improving methylation process, when all other practitioners had dismissed it’s importance with regards to my health and wellbeing. Joanne had helped to identify high levels of histamine within my body, which presented to me identically as Endometriosis symptoms; such as chronic adrenal fatigue and painful bloating. This has been a vital piece in the puzzle, as I was already eating an immaculate organic wholefood diet, and nothing was making sense. I share this detail because, I am sure there are other Women, struggling through the complex foggy maze of Endometriosis symptoms who are not able to clearly identify what is what, and what can be quickly and effectively treated and ticked off the list, so to speak. What is most important; is that Joanne has helped me drastically improve my daily wellbeing: physically, mentally and emotionally. This has given me much needed relief, space and a renewed vigor to passionately create even greater levels of wellness, while living with Endometriosis.